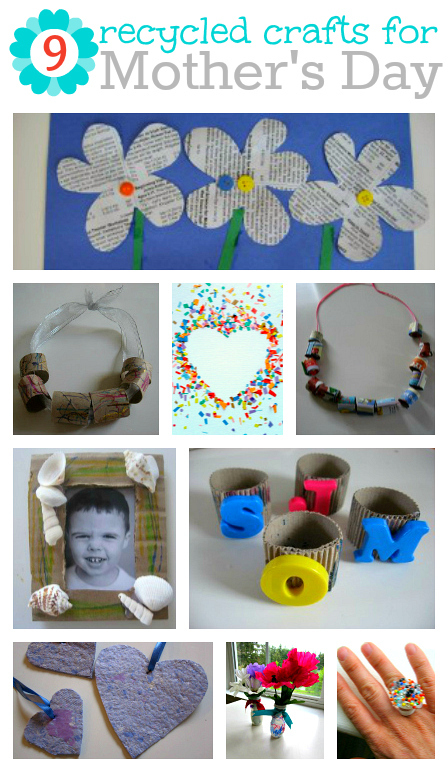 Mother’s Day crafts ideas don’t have to be elaborate they just have to be made from the heart. These crafts also take Mother Nature to heart and are made with one of more recycled material like scrap paper, old books, even those little plugs from milk and juice cartons. One of the best parts of creating with your child is the time you spend together. 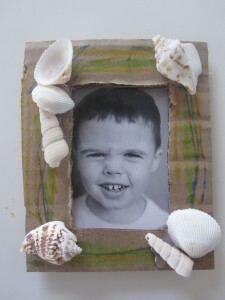 Parent and tot projects like this Beach Shell DIY Craft Picture Frame are a special time to not only work together on something but also to practice taking turns something that can never be done too much . Gather your materials. You will need some cardboard ( 2x as large as you want the frame to be) , a large magnet , crayons, shells, hot glue gun and glue, scissors , tape and a picture. Start by cutting your cardboard in half, then cutting an opening in one piece for the frame. Tape your picture ( I trimmed mine) on the other half of the cardboard. Trim the cardboard so that it’s no larger than the frame piece , you don’t want it peeking out from underneath. Have your child decorate the frame with crayons. Heat up the glue gun. Glue shells on, Glue the magnet on the back of the piece with the picture. Glue the two pieces together and let cool. Gather your materials. 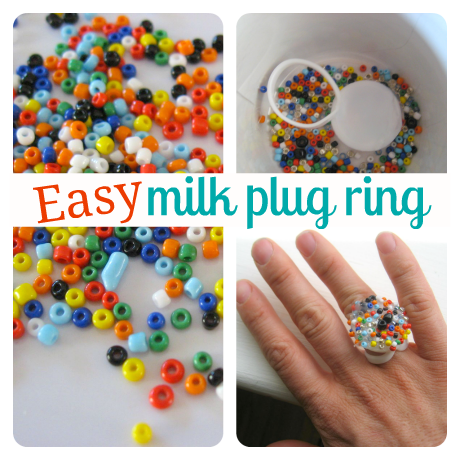 You will need some milk carton plugs, hot glue gun, hot glue, seed beads, and a small dish that won’t stick to the glue. I used a 2nd dish for the ring to cool in but that was just my preference. Pour a mixture of seed beads into a small dish. You don’t want to use too big a dish because you want the beads to be close together . Turn the plug inside out , so when you slide it on your finger the solid part stands up against your finger. Add hot glue to the solid part that will be facing out. You want a lot of glue. Quickly dip it into the beads, gently press it into them. Let dry! It’s that easy. Just remember to let it dry completely before wearing it. Are you looking for unusual baby gifts? Something creative and educational but fun at the same time. I found these fabulous interlocking blocks on The Travelling Souk, their bright colours caught my eye so I decided to read up about them. They make impressive unique gifts due to their quality and hone basic motor skills and promotes creativity. The child can build castles and towers, make flowers and gardens and even put together letters and words. I was so intrigued by the products on The Travelling Souk I spent hours looking at some of their unique gift ideas, there are gifts for everyone, any age group and gender, from household gifts, toys, clothing, jewellery to wedding gifts, gifts for men and gardening. The best part about shopping on their on line store is the convenience of shopping in the comfort of your own home without having to walk the high street for hours. You can do all your shopping under ‘one roof’. Unusual gifts are often hard to find especially on the high street, look no further than The Travelling Souk who brings a luxury shopping experience to you! They have over 150 vendors selling their Unique gifts, who have been chosen for their excellent quality and fantastic customer service. The original gifts found on The Travelling Souk Market Place will suit all genders and ages.Shopping just became easy and a great experience with The Travelling Souk. The Travelling Souk have carefully selected a collection of sellers and designers chosen for their exclusive portfolio of luxurious, unusual gifts which may have been created anywhere from a British country cottage industry to the most exotic Southern Sea Island. Start your Christmas shopping early and avoid the stress and rush of last minute shopping. Are you looking for unusual ideas for your little one or your niece or nephew? Tired of giving them the same gifts as everyone else gives? Perhaps you are looking for something fun and educational for a friend’s child. I have sourced some fabulous gifts for babies on The Travelling Souk and online boutique also having exceptional unique baby gifts. They have some super gift ideas such as this Pull along rabbit which is just the cutest toy for little ones to enjoy! Beautiful hand made metal planters make great plant pots, vases or unique enough to be used simply as decoration. The hand made rustic finish gives the planter a slight antique look. Idyll Home is a vendor on The Travelling Souk where you can find Unique Gifts, Gift Ideas, Original Gifts, Unusual Products, Unusual Gifts, Personalised Gift Ideas, Personalised Gifts, Handmade Gifts and Gift Fairs! Hand painted funky sign in F&B colours with charcoal writing and wire for hanging. A perfect gift for that friend who has chickens! Matt finish and lightly distressed. deSign 12is a vendor on The Travelling Souk where you can find Unique Gifts, Gift Ideas, Original Gifts, Unusual Products, Unusual Gifts, Personalised Gift Ideas, Personalised Gifts, Handmade Gifts and Gift Fairs! A cute heart shaped tin decorated with Emma Bridgewater’s Sampler design. A perfect little tin decorated with the Sampler design and the word ‘Love’ across it, ready to be filled with sweets or other goodies as a gift, or just the right size to keep hair slides, jewellery and other precious treasures in. Or you could just admire it as it is such a pretty tin! W12cm x H11cm x D3cm – Made from tin. Wipe clean with a soft cloth and then dry. Molly & Madeleine is a vendor on The Travelling Souk where you can find Unique Gifts, Gift Ideas, Original Gifts, Unusual Products, Unusual Gifts, Personalised Gift Ideas, Personalised Gifts, Handmade Gifts and Gift Fairs! Our Bright and beautiful hammocks are strong and comfy. They come with matching coloured ropes and a large aluminium ring to attach the hammock with rope. To prolong life, do not leave outside for extended periods. Plum is a vendor on The Travelling Souk where you can find Unique Gifts, Gift Ideas, Original Gifts, Unusual Products, Unusual Gifts, Personalised Gift Ideas, Personalised Gifts, Handmade Gifts and Gift Fairs! Zinc Coat Rack is both Practical and stylish coat racks with a zinc powder coated finish. Length 80cm, seven hooks will enable you to hang many items on one Coat Rack. Designed by John Robshaw in New York and hand block printed in Thailand by local artisans skilled in ancient traditions. These cushions are beautifully made and printed on both sides. One of our favourite finds, transform your sofa or bed with these stylish designs.